With the recent release of Xbox Music, and an already flooded market of streaming music services, the streaming space just got bigger and better. The app is designed with playlists and collections in mind: this is not a Pandora clone at all. With 30 million songs in the music library, there’s a lot to listen to here — and the sound quality is impressive! Besides just being great, the app lets you stream to your iPhone (for an ad-free monthly rate) and listen on your desktop for free. For the mobile version, you’ll need an Xbox Music Pass subscription ($9.99 per month or $99.99 per year). All you need is to sign up — either with your current Microsoft login or a new user account — and then start exploring. The user interface is incredibly simple. Your music is separated into your Collection (i.e., albums, artists, and tracks) and New Playlists. Click the Explore button and you’ll get a visual splash of new singles, plus a decent collection of new releases. Try starting with a Search. Enter your favorite artists and start building your collection. My guess is that this is just the beginning, and eventually Xbox Music will become a mixture of Pandora and Spotify — with suggestions and collections in mind (though that might annoy some users). But the simplicity is attractive. The fact that it makes you “dig” for tracks is refreshing (it’s one of the reasons why Spotify dominates the streaming market). Alas, the music catalog doesn’t quite compare to Spotify’s, but it’s still good. The app has many similarities to Google Play Music in style, functionality, and cost (although Google Play Music is a paid service while Xbox Music will stream free on your desktop). But Xbox Music is great for new releases. 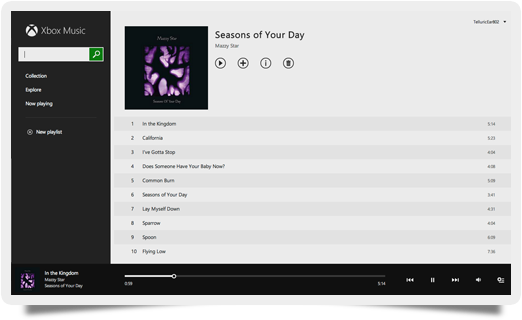 The expansion beyond Windows 8 and the Xbox ecosystem is intended to enlighten new users and compete directly with Pandora, Spotify, and iTunes Radio. In that regard, Microsoft has done a pretty fantastic job with this new release. Xbox Music is new and it’s good — try it out. Happy streaming!